Anti-vaccination activists at a rally at Olympia, Washington on Feb. 8, 2019. Amid a measles outbreak in Washington state that officials have confirmed has spread to at least 51 people and suspect to have spread to over a dozen others, hundreds of people showed up to a rally on Friday to demand the right to keep exposing their kids to the possibility of contracting easily prevented, potentially fatal illnesses, multiple outlets reported. 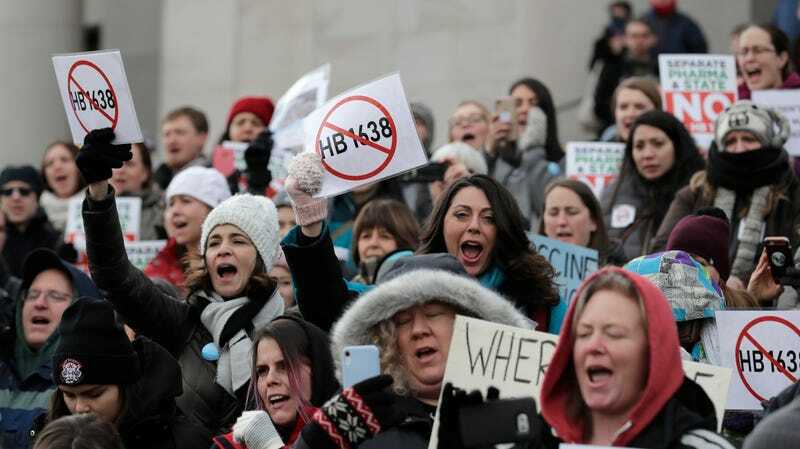 According to the Washington Post, an estimated 700 people showed up to rally outside the State Capitol, “most of them opposed” to a proposed bill that would eliminate personal or philosophical exemptions to requirements families immunize their children against measles, mumps, and rubella (MMR). Joined by Robert F. Kennedy, Jr.—a longtime promoter of the debunked conspiracy theory linking autism to a mercury-based preservative, thimerosal, pulled from most vaccines starting in 1999—the anti-vaccination crowd parroted claims of a government coverup, insisted their children had been harmed or sickened by vaccines, and in one case “falsely said the majority of people diagnosed with measles have been vaccinated,” the Post wrote. Robert F. Kennedy, Jr. speaking at an anti-vaccine rally in Olympia, Washington on Feb. 8, 2019. According to the Post, the bill would preserve existing religious and medical exemptions to vaccination requirements. The Centers for Disease Control (overwhelmingly supported by the scientific community) rates two doses of the MMR vaccine as completely safe and 97 percent effective. The antivaxxers made it abundantly clear that they will refuse to make any concessions to reality. “Do we want to be a country that forces children or parents to engage in risky medical interventions without informed consent?” Kennedy asked, per Oregon Public Broadcasting. As the Post noted, the Pacific Northwest is home to some of the “nation’s most vocal and organized anti-vaccination activists,” which has driven the rate of unvaccinated children higher in Washington, Oregon, and Idaho (up to 10.5 percent statewide in Idaho). Health officials have stated that the outbreak, which is centered around Clark County, is primarily spreading among children under the age of 10. Before we had routine vaccination in the United States in the early 1960s, we had 400 to 500 deaths from measles every year. There were close to 50,000 hospitalizations every year for measles, and we had about 4,000 people who had measles encephalitis, which is a swelling of the brain that can lead to permanent damage, including deafness. It’s an incredibly serious disease that can have a lot of complications, and we’ve already had one child hospitalized out of the cases here. It is also highly contagious. If you’re susceptible and you haven’t been vaccinated, you can be in a room two hours after somebody with measles left and still catch it. If somebody with measles is around a bunch of people who are unvaccinated, 90 percent of them will become ill.
As the Daily Beast reported this week, measles can also trigger subacute sclerosing panencephalitis (SSPE), a form of chronic brain inflammation that is almost invariably fatal. The antivaxxers may be willing to accept all these risks, but much of the general public seems to have been alarmed by the spreading outbreak. The number of people receiving the MMR vaccine is up 500 percent, with more than 1,000 people in the last two weeks of January, Wiesman told the Post. In 2015, both California and Vermont passed laws removing personal belief exemptions amid a measles outbreak at Disneyland.